Does the current tight system give a flavour of the winter ahead? 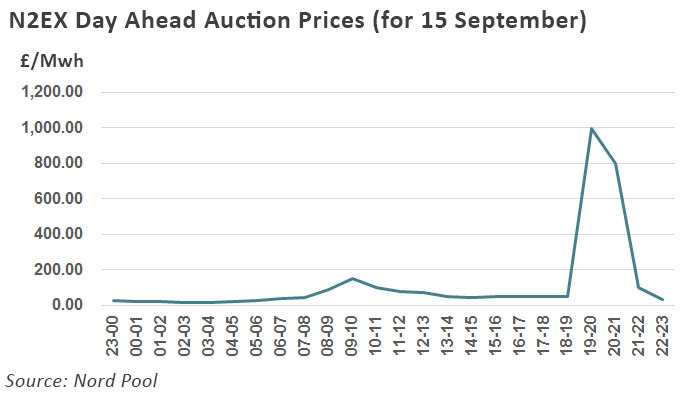 This week has seen high peak power prices, with day-ahead prices in the N2EX auction spiking at £999/MWh yesterday, as the system was shocked by a combination of planned maintenance, unplanned outages, low wind output and high demand as the unseasonable warm temperatures led to higher air-conditioning usage. This was after the exchange had to open a second auction, which occurs if the upper limit of £500/MWh is reached in any 1-hour period. Unplanned outages at the Drax and Hartlepool plants as well as the IFA interconnector with France led to a forecast supply shortfall of 4 GW for the peak hours this evening, according to Elexon’s BM reports published at 12:30 yesterday, as reported by ICIS. National Grid has described the situation as “a little tight” but “completely manageable”. On the positive side, National Grid has managed the situation without needing to resort to any special measures and no NISM (Notification of Insufficient System Margin) was issued, although some plants have seen offers over £1000/MWh being accepted in the Balancing Mechanism. The system out-turned short yesterday in SP 35 (5pm) leading to a cashout price of £664/MWh, up from the low £30s/MWh in the surrounding settlement periods. Looking forward to the winter, the 8 GW of capacity currently unavailable due to planned maintenance programmes can be expected to be available in the winter. However, this experience does provide an example of how high demand can coincide with low wind supply. In this case, we a have high pressure weather system causing a demand spike for cooling at the same time as low wind output due to the still conditions. A similar weather system in the winter would result in high demand for heating as sunny winter days tend to be colder. In such conditions, the system relies on conventional generation sources to meet demand. With accelerated coal plant closures there is very little spare capacity….unplanned winter outages could yet cause real problems. ← Roughing it: what will the loss of Rough gas storage mean this winter?